Threats to Homeland Security, Second Edition examines the foundations of today's security environment, from broader national security perspectives to specific homeland security interests and concerns. It covers what we protect, how we protect it, and what we protect it from. In addition, the book examines threats from both an international perspective (state vs non-state actors as well as kinds of threat capabilities—from cyber-terrorism to weapons of mass destruction) and from a national perspective (sources of domestic terrorism and future technological challenges, due to globalization and an increasingly interconnected world). 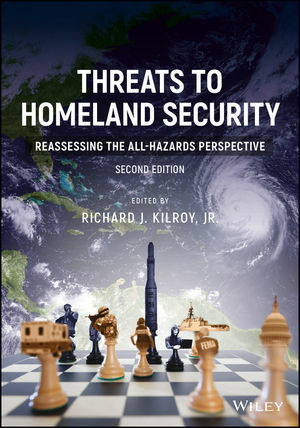 This new edition of Threats to Homeland Security updates previous chapters and provides new chapters focusing on new threats to homeland security today, such as the growing nexus between crime and terrorism, domestic and international intelligence collection, critical infrastructure and technology, and homeland security planning and resources—as well as the need to reassess the all-hazards dimension of homeland security from a resource and management perspective. Threats to Homeland Security, Second Edition is an excellent introductory text on homeland security for educators, as well as a good source of training for professionals in a number of homeland security-related disciplines. Richard J. Kilroy, Jr., is an Assistant Professor of Politics at Coastal Carolina University in Conway, SC where he teaches courses in Intelligence Operations, Intelligence Analysis, Terrorism and Political Violence, Security Management and Risk Assessment, Homeland Security, and U.S.-Latin American Relations in support of Information Systems Technology, Political Science, and Intelligence and National Security Studies degree programs. He spent 23 years in active duty as an Army Intelligence and Latin America Foreign Area Officer.